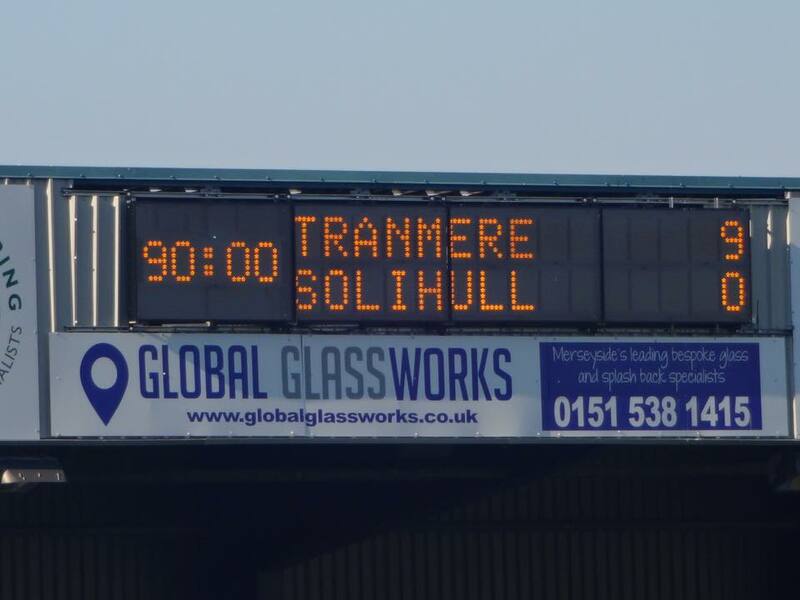 Tranmere Rovers 9-0 Solihull Moors. 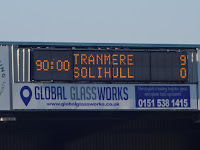 Tranmere Rovers delivered their biggest win of the season, and their biggest margin of victory in many years, as they demolished Solihull Moors 9-0 to keep up the pressure on Lincoln City. With five wins in a row, and with the dramatic last-minute 3-2 home win over Sutton United fresh in mind, it was imperative for Tranmere to continue the momentum, and the huge scoreline suggests that they are up for the challenge as the final few weeks of the season approach. Ironically, it was Solihull who could have taken the lead first, albeit in unusual circumstances. Solihull started slightly stronger before Tranmere came into the game with a few opportunities, but a defensive mix-up saw Tranmere captain Stephen McNulty head the ball over his own goalkeeper Scott Davies. Solihull's Omari Sterling-James tried to capitalise on the good fortune, but the ball trickled out past the post just in time to avoid Tranmere's blushes. Fortunately for the home side, things began moving moments later when, on 20 minutes, Cole Stockton headed home from close range following a perfectly-timed cross by James Norwood. 1-0 became 2-0 just a few minutes later when Stockton delivered a fine curling effort from outside the penalty area. A chance for Stockton to get his hat-trick in pretty short time was denied when Solihull shot-stopper Danny Lewis saved Cole's penalty attempt, but right on half-time, Stockton slid in to convert for both his and Tranmere's third goal. It was only three minutes into the second half before a low-range effort by Connor Jennings boosted the score-line and effectively ended Solihull's hopes of a stunning comeback. Jennings headed in his second goal off a corner to make it 5-0 just two minutes later, but whilst the pace slowed down from there as Tranmere looked to concentrate on their defensive game, just to make sure that they maintained a clean sheet, they were back scoring on 68 minutes as Andy Cook slotted home off a cross by Lee Vaughan. At that point, it seemed that Tranmere's work was done for the day, but with a significant goal difference margin between them and Lincoln to attempt to trim down, Rovers went in for the kill: Liam Ridehalgh curled in a fantastic top-corner free kick on 84 minutes, Jennings became the second Tranmere player to net a hat-trick when he delivered a stunning curler of his own right on 90 minutes, and Aaron Collins completed the scoring in stoppage time for a quite frankly incredible 9-0 victory. Tranmere were rampant, and their fans were jubilant and excited at just how ruthless the home side had been. Solihull, for their part, were swept aside akin to a tornado heading through a busy city, such was the futility of any potential resistance. Not that this changed the gloom amongst the players or for the 85 fans who admirably stayed for the whole match despite the massive scoreline, nor for manager Liam McDonald who held a post-match team talk on the pitch in front of the away support. The only downside to the day's activities was that Lincoln had claimed a fairly late win over Eastleigh to keep hold of top spot. However, although Lincoln have a game in hand over Tranmere, the ruthless manner in which Rovers went about business will send a shiver down Lincoln spines; if they slip up at any point, Rovers will be right there to capitalise. The race for the National League title appears to be an intriguing and unpredictable one that will go right down to the wire, but if this 9-0 destruction is any indication, Tranmere have what it takes to push Lincoln all the way to the finish line. Man Of The Match: A rare three-way tie. Cole Stockton could have had four when all was said and done, and Connor Jennings' own hat-trick cannot be ignored. However, James Norwood was superb all afternoon in chasing the ball down and setting up several goals before being substituted to a huge ovation.